Phenomenal value! Performed by the Joslin Grove Choral Society and the 101 Strings Orchestra, this collection of beloved hymns features such favourites as 'Amazing Grace', 'Day By Day', 'The Old Rugged Cross', 'Joyful, Joyful We Adore Thee' and many more. 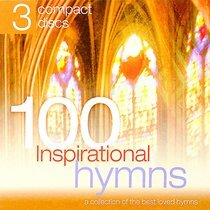 About "100 Inspirational Hymns (Abridged Versions) (3 Cds)"
Customer Reviews For "100 Inspirational Hymns (Abridged Versions) (3 Cds)"
The high standard of singing is matched by a very high standard of recording. I am very impressed by the sharp crisp sound. These CDs go well with a high quality sound system.